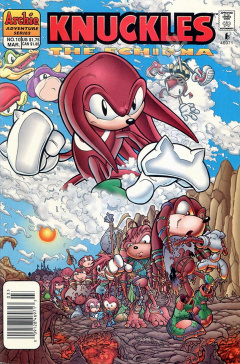 Knuckles the Echidna 10 is the tenth issue of the Knuckles the Echidna comic. This comic features one story: "The Other Road Taken", the first part of the The Forgotten Tribe arc. Continued from issue 57 of Sonic the Hedgehog. Yea, though he be his brother's keeper, there will come a time when the heralds beckon, raising the guardian to a higher plane, and another shall lead them to journey's end. With this quotation, the story opens up in the recent past, set before Knuckles 9 and Sonic 56. Athair is distracted from his meditation by his disciple, Yanar. Athair takes Yanar aside to confer upon him the role of leading a lost tribe of echidnas wandering toward their journey's end. Athair then departs with the Ancient Walkers for Echidnaopolis. In Echidnaopolis in the present, Lara-Le emerges from an aurorium, a sun temple, to discover her son awaiting her outside on the sidewalk. The two discuss Knuckles' lack of a childhood as they return to Lara-Le's apartment. There, they find Athair, whom Knuckles rudely greets. Lara-Le chastises him for his condescending behavior and makes him apologize. When Athair is pressed to explain his presence, he teleports Knuckles and himself out of Lara-Le's apartment. Lara-Le is left to bemoan the pressures on her son. In a different part of Echidnaopolis, Constable Remington is trying to extract information from Julie-Su in interrogation. Remington presents her with affidavits affirming her ties with the Dark Legion. When Julie-Su suggests that Remington should get Knuckles' testimony, he informs her that, due to his disintegration at the hands of Enerjak previously, the guardian's memory of recent events is hazy. Remington takes his leave and is presented with a case to look into the whereabouts of an ex-convict. While contemplating this, he is visited by Archimedes, who is searching for Knuckles. In fact, Knuckles is on the surface of Mobius with Athair, beholding a tribe of echidnas. Athair explains that Knuckles' ancestors, Jordann and Kayla-La, observed the coming of a great comet on a collision course with Echidnaopolis (events first mentioned in "A Sense of History" in Sonic 34). Kayla-La proposed raising Echidnaopolis into the air, while a holy man by the name of Arakkis proposed the echidnas migrate to a different part of Downunda. The High Council voted in favor of Kayla-La's proposal, but offered the populace a choice: stay in Echidnaopolis or leave with Arakkis. Some echidnas opt to follow Arakkis while the rest launch from the ground on the newly-formed Floating Island. Arakkis' tribe wandered across the continent, unable to locate a place unclaimed by others or not full of inimical natives. Time wore on, and the tribe found itself foregoing its deteriorating technology in favor of a simpler mode of life. It was then that the Ancient Walkers came to Arakkis for help in protecting the echidnas. While Charmy Bee flies into a diner in Echidnaopolis to inform the rest of the Chaotix that Constable Remington wants them for a special assignment, the earth begins to rumble everywhere: Echidnaopolis, Knothole Village, Mercia, Downunda, and the valley where Knuckles, Athair, and the echidna tribe are. Magma spews out of the ground near the echidnas, prompting Knuckles to dive in and rescue his brethren despite Athair's resigned manner. However, the lava is rising fast and Knuckles has little time to save the entire tribe from a fiery extinction. A store in Echidnaopolis is named Pepoys, after inker Andrew Pepoy. It is likely a pun on the American auto parts and service chain Pep Boys. This page was last edited on 14 March 2015, at 06:42.